A great day was had by our juvenile athletes in Moyglass at the County Juvenile “B” Cross Country championships where Louise Hickey and Emma Leahy were crowned County Champions while Aine Duggan and Helen Cleere were runners-up in their respective races with Jack Guilfoyle, Mairead Duggan, Olive Spillane Leane, Rogan Lyons, Blathnaid Lloyd, Maeve Leahy, Jack Reddan and Jack Gleeson all winning bronze individual medals. In addition the Girls U/9, Girls & Boys U/11and Girls & Boys U/13 all won team medals. The Girls U/9 had five club athletes competing and young Mairead Duggan led them home in an excellent fourth place with Olive Spillane Leane just yards behind in 7th. Both Girls won bronze medals. Next to cross the line was Laura Fogarty in 25th with Maria Doyle 26th and Niamh Gleeson 28th. The Girls combined to win bronze medals in the team competition on a score of 36pts. In the Boys race just Jack Guilfoyle and Rogan Lyons competed for the club but both came away with individual bronze medals following their 3rd and 10th places respectively. The club had the biggest representation in the U/11 age group with 18 athletes in action between the Girls & Boys. Very strong running from Blathnaid Lloyd and Maeve Leahy saw them finish 4th and 5th respectively and earn bronze medals and with the back-up of Dearbhla Gleeson in 11th the Girls won the silver medals in the team competition. Cara Delaney came through for 23rd followed by her sister Emma in 25th with Orla Duggan 26th Ciara Fogarty 28th and Kate Delaney 30th to finish 5th in the club competition. Jack Reddan and Jack Gleeson powered home to finish 5th and 8th in their event and also collect bronze medals. With the backing of Jack Flanagan in in 16th they finished second in the club competition on 22pts. Fred Power, Sean Boland, Sean Lyons, Frank Doyle and Jimmy Campion all battled it out to finish 18th, 19th, 20th 21st and 22nd. Coming through for 24th was John Delaney with Liam Ryan in 27th and Marty Kiely 34th. With this strong contingent the club also finished 4th and 5th in the team competition. 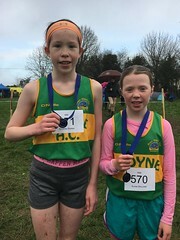 The club had a one, two in the Girls U/13 race where Louise Hickey and Helen Cleere stole a march over the rest of the field with Louise crowned the County Champion and Helen winning the silver medal. Tara Gleeson ran a very solid run for 11th and her effort saw this trio win the club title on 14pts. Also in action were Una Duggan and Marian Campion who finished 15th and 18th respectively. Our trio of Boys in their event combined to win bronze medals in the team competition with Cormac Burke in 10th, Cormac Kiely 11th and Liam Ryan 19th. At U/15 level all three athletes who competed won individual medals with Emma Leahy crowned the Girls U/15 champion. She was followed home by Aine Duggan who finished second to win the silver medal. In the Boys race Cian Dunne came through for 3rd and win the bronze medal for his great effort. Congratulations to all the athletes on their excellent performances in Moyglass and no doubt we will see many of them in action again on Sunday at the County Cross Country Relays.